Good Lights with secure attachment. I really like these two lights. While I do not commonly ride at night, I am often out at dusk and really appreciate the extra visibility provided both front and rear. I have had several lights that fell off my bike but these both mount securely to my front and rear bags. I have not yet tried the mounting brackets that come with the lights. My favorite feature is the recharging capability. The lights attach to an electrical outlet via a USB connector and charge quickly and flash green when fully charged. I am glad I found these lights and recommend them for casual riding. The rim of the headlight bleeds light into rider's eyes and is distracting. Trim with electrical tape to mask. Very bright although lacking in looks! I bought these Blackburn lights for 2 reasons. 1) They were on sale. 2) I needed a set of lights to ride with while my other Blackburn light was warrantied. I have a set of Flea 2.0 lights, and the headlight died. Blackburn has a lifetime warranty on lighting products so I just had to wait until they shipped me a new one. Problem was, I had a ride coming up where I was required to have a head and tail light. Western bike ships to my location in 3-4 days so it was a no-brainer to order a set of these. They are big when compared to the Flea, and rather utilitarian looking in a Honda Element sort of way. But, they are very functional (BRIGHT), charge quickly with USB, last a long time and are warrantied for life! I still use my Flea lights on my road bike, as I've become somewhat of a weight-weany. So, I let my son use these when he rides his scooter to school. He attaches the front to the vertical handlebar post and the rear to the grab handle on his Swiss-Gear backpack. He could just as easily not use the bar mount and just clip it to a pocket on his backpack also. These lights would be great for commuting or general riding. Keep in mind though that although these lights are great for alerting drivers that you are there, they are not a replacement for a good headlight for night riding. And I don't think they would be good for mountain biking for the same reasons. I've been using these lights for about a month in the NW and I love them. I just had to recharge them after about 3 weeks of use (1-2 hours at a time). They have great rubber mounts, which allows me to easily switch them between bikes (or take off and store so someone doesn't steal them). They are insanely bright, as in will leave spots in your vision bright. I road on a familiar road in the pitch black with them and wouldn't recommend them as your sole source of light. Durability remains to be seen, but so far so good. Bottom line excellent rechargeable lights for a good price. I use for my commuter bike. 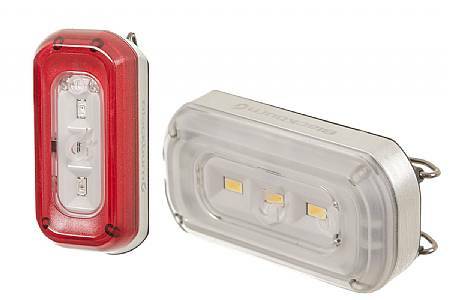 The rear light has limited options for flashing, but it works great, and charges easily and fast. It's mounted on my seatstay and is secure. The front light is good for visibility, not for providing much light. I put some electric tape over the top to avoid it shining up at me, and have used it for daytime rides, especially in haze or rain. Not a great light for very dark roads. For the price, a very useful set. Simple install, great visibility, great basic commuting package! Used for regular commuting, year-round.